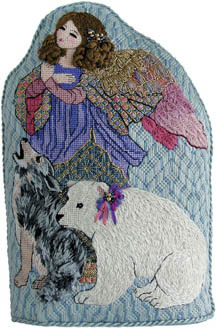 Gracing the cover of the Nov./Dec., Volume III, Number 6 issue of needlepoint now, is a fabulous new freestanding stitchery of the angel, Kristina, flanked by a polar bear and a timber wolf set against a backdrop of northern lights. Named Kristina and the Carolers, this design vividly portrays a touching holiday scene. The cold crisp forest rings with carols from the clear soprano of angels to the mellow tenor of Timber, the wolf, and the deep bass of Crystal, the polar bear. As the ancient hymn says, "All nature sings and round me rings the music of the spheres." Celebrate the holiday with this charming trio of enthusiastic carolers. 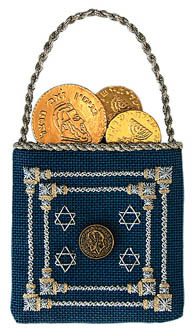 Celebrate Hanukkah with this handsome Gelt Bag Ornament by Michele Roberts. Ms. Robert's lavish design is a companion piece to the Menorah presented in the Nov./Dec. 2000 issue of needlepoint now. This project is not only lovely, but is surprisingly quick and easy to stitch. 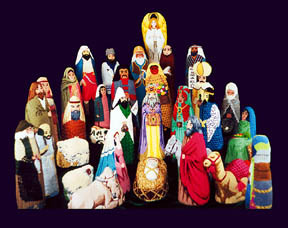 Evelyn Sayer of Excelsior, MN stitched this Christmas Nativity Creche over a period of nine years to create this magnificent Christmas display. The undertaking eventually expanded to include thirty-two pieces. Canvas artist, Lynn Wright, was commissioned to design and paint the traditional figures. By 1978, Ms. Sayer had completed stitching the Holy Family, the Wise Men and the Shepherds, which she entered into a world-class needlework competition held in Monaco. It garnered her first prize, along with the Princess Grace Award. This fun design from Pam Douda is perfect for holiday decorating or gift giving. Using a subtle but sophisticated color palette of gentle creams and metallic threads, Pam's project belies how quick and easy it is to make. It can be completed as either an ornament to grace your tree or finish it with a backing, kept open at the top, to use as a gloriously innovative gift bag to hold that extra special something for that extra special someone! 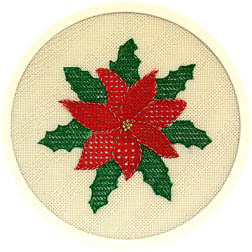 Vibrantly displayed on the back cover of the magazine is Lou Kilgore's Festive Poinsettia, executed using time honored pulled thread techniques, resulting in a finished piece which mimics lace! Though geared to advanced stitchers, Lou makes suggestions for how even beginners can complete this spectacular holiday floral. Special thanks are extended to Joyce Lukomski, Editor, and the staff of needlepoint now, for providing the photos of the designs and accompanying text for this feature. The premier issue of needlepoint now made its debut with its March/April 1999 issue. Editor Joyce Lukomski's hope for the magazine was that it fill the gaping hole that resulted when a favorite needlepoint publication stopped production several years prior. 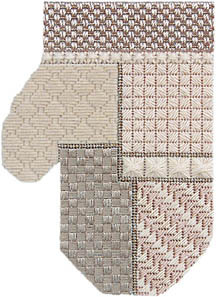 She states, "We want to offer a product that educates, inspires and sometimes amuses... a product available to everyone who loves to stitch... a product that will help advance needlepoint as an art form." Joyce views the venture as a marvelous opportunity to fulfill a long-held dream while sharing her passion with countless kindred spirits. Assistant Editor, Maria DeSimone concurs, adding, "With the birth of needlepoint now, my involvement in needlework is moving to a wonderful new level. I am embarking on an exciting adventure, one that I look forward to sharing with all our readers." Circulation Manager, Sarah Bennett, shares her aspirations, "As stitchers we all treasure the heritage and traditional ways of needlework, but to pass these on to future generations we must be able to get to the people." The mission of needlepoint now, as its three founders perceive it, is to create an educational journal that will present needlepoint as an art form, by offering projects with instructions, features for continuing education, articles on personalities, technique, current events and other topics that will enhance the knowledge of the art. With 10 issues under its belt, needlepoint now is no longer an infant, but an active, healthy and exuberant toddler. Subscriptions can be ordered by phone (804) 732-9140 or through the needlepoint now website at http://www.needlepointnow.com.